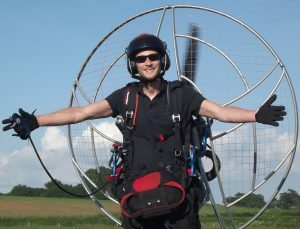 Before I teach you how to launch a paramotor I need to stress that this article is not meant for training purposes. It's meant as a guide and should only be used in the presence of an instructor. If you don't have an instructor, or if you have not completed your training, please read another one of my articles. This guide can also be used by pilots that have already completed their training but need further guidance. DO NOT ATTEMPT TO FLY A PARAMOTOR WITHOUT TAKING PROPER TRAINING. If you're reading this article you must be struggling with your launches. I'm going to teach you the exact method that I use to nail forward and reverse launches every time. During training students tend to practice reverse launching all day long in stronger conditions. This is great if you're launching in strong wind, but most of us launch early morning/late evening when it's super calm. Forward launching is covered during training, but not so much time is spent perfecting it. The majority of people reading this will be able to reverse launch perfectly, but will be struggling with forwards. I've only ever had to use two reverse launches since completing my training five years ago, and I fly a lot! So you can see how important forward launches are. Nevertheless we will still cover reverse launching to help anybody that needs it. The best way to perfect your launches is the practise without the motor. Get yourself a ground handling harness or buy a secondhand paragliding harness like I did. This way you are carrying less weight, you won't get so tired, and you'll be able to practice for much longer. Practice this way until you're confident you can nail a launch every single time. And once you have it perfected, keep practising once a week minimum, you can never do enough ground handling. This repetition trains you to react perfectly to what the wing is doing, this is called muscle memory. When you add the motor things will feel more natural and you'll be more likely to succeed at launching. The video above shows me forward launching my paramotor with very little wind. I will be referencing this video throughout this explanation so please watch it first. So the first thing you will need to do to forward launch a paramotor is lay the wing out correctly. This is super important for getting the wing to come up straight and to inflate evenly. As you can see in the video, or on the picture below the wing is laid out in a slight boomerang shape. It needs to be facing directly into the wind with a good amount of runway in front of it. You should be prepared with a good indicator to use in very low wind, the best thing is smoke, or some kids bubbles. Even if you think there is no wind this will always give a good indication of the wind direction. You should keep the leading edge taut along its whole length with the A lines facing up. Once laid out I ensure that there are no tangled lines by lifting the risers keeping the A's facing up. You can see me doing this in the picture below. At the same time use the brake lines to pull both tips of the wing about a foot towards you. This can be seen by looking at the laid out wing in the video. This ensures the tips will inflate last, preventing the wing pulling to one side on launch. You can now take the risers to the centre of the wing ready to clip in, be careful not to disturb the wing. Take a look at the picture below to see where I place the risers. Be sure to leave some slack so that you don't pull the wing over itself whilst clipping in. 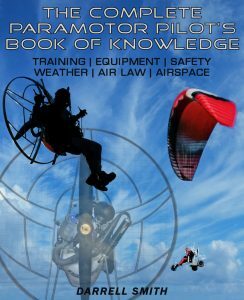 You can now get strapped into your paramotor, or your ground handling harness if you're still practising. You should already know how to clip the wing in correctly, if you haven't yet learned your instructor will help. So clip in and check the carabiners are locked closed. Take hold of the brake toggles first, release them from their magnets and then grab the A lines as taught during training. Flip the rest of the lines over each forearm so that they hang down, back behind your arm. You can now centre yourself up in front of the wing by holding both arms straight out from your sides. Walk forwards slightly until you feel slight tension equally on both left and right lines. You can see me doing all of this on the video at the same time as shaking the lines to free them up. Shaking the lines will ensure that they're all separated and untangled. I will now also check that the A lines are still on top, this means I've clipped in correctly. You are now ready to launch the wing, so focus on an object directly in front of you in the distance. When you start to run you will stay focused on this object and keep running directly towards it. When you're ready have a quick look up to make sure no other aircraft are overhead. If you're ready to launch take a big step back, keep your arms out stretched and run forwards with force. Some instructors will tell you to keep your arms locked in front of your shoulders whilst forward launching. This may work, but I found outstretching my arms to be the thing that improved my launches the most. So when you are running forwards you need to be fully committed to the launch. As soon as you feel the risers go vertical the wing is overhead, you can now release the A's. As soon as you know the wing is flying straight gently increase the power to push you along. Stay fully committed and keep running until even after you're feet leave the ground. This is the exact way I launch a paramotor and I never fail a launch. Try it out in your ground handling harness until you have it perfected. Make sure the wing is laid out directly into the wind. Ensure all lines are free from tangles. Create a boomerang shape and pull those wing tips in to ensure the centre lifts first. Leave plenty of slack in the lines so you don't move the wing while clipping in. Re-check the wind direction right before clipping in. After clipping in check carabiners, check the A lines are on top, and shake all other lines free. Make sure you are dead centre. Be fully committed to the launch. Here's one more video of me forward launching my paramotor. Check out the thumbnail, you can see those wing tips are the last point of the wing to inflate. This is important to prevent the wing dropping off to one side. The video below shows an on-board view of me reverse launching. As previously mentioned I've only used reverse launches twice since training, so unfortunately I'm limited on footage. This video was taken during my training and is the best I can show you at the moment. But there are plenty of pictures to help you out. I will try to update this video with a good explanatory video asap. 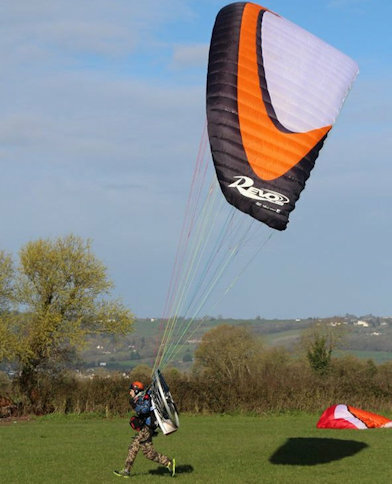 See below for a thorough explanation of reverse launching a paramotor. 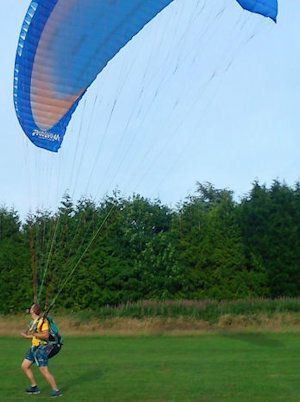 To launch a paramotor this way you will need plenty of wind to kite the wing. Reverse launching can be done with lower wind speeds, but you will have to move backwards to keep the air flowing into the wing. This is difficult and will increase the risk of tripping over and breaking something, so forward launches are preferred. Lay the wing out into the wind the same as explained in the forward launch section. This time you don't need to pull the wing tips in as you will be controlling it with the A's. Make sure all lines are untangled, then lay the lines and risers out in front of the wing. Keep the A lines facing up, and remember to leave plenty of slack in the lines so you can clip in easily. 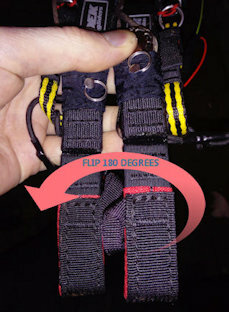 You can now strap in to your paramotor or ground handling harness. Take both risers in your hands and hold them as pictured below, with the A lines still facing up. Flip the risers 180 degrees anticlockwise so that the right riser will clip into your left carabiner and vice versa. Clip the risers into your carabiners and make sure they are locked closed. The reason for flipping the risers will become clear later on. Now take the brake toggle from the riser that's clipped into your left carabiner, in your left hand. Take the other in your right hand and make sure they aren't wrapped around the other lines. Grab both A risers with your left thumb and index finger at the steel maillons. And grab both D risers at the maillons with your right hand. Take a step back and put slight tension on the A lines to inflate the wing. This is called building a wall and it should look like the picture below. This opens the wing along its full length and prevents it flipping over as you start to lift it. When you have a nice wall built you can increase the tension on the A's to bring the wing up. By releasing the tension on the A lines the wing should drop back down. If it doesn't pull on the D lines that you are holding in your right hand to lower the wing. If the wing starts to drop on either side or moves left/right, move the D lines to correct it. You will be moving the D lines and risers in the same direction as the wing is dropping. So if it drops to the right, move the D's to the right, but it's all about small gentle movements. When you are happy that the wing is flying nice and stable above your head you can release the A lines. Once you've let them go you will then be controlling the sideways movements with the brakes. So the same still applies, wing moves right - pull right brake, wing moves left - pull left brake. Once again, wait until the wing is nice and stable, and when you're ready you will turn around 180 degrees. Remember, you flipped your risers 180 degrees, so turning will correct them so that the A's are facing forwards when you turn. Because you flipped the risers anticlockwise (left) you will have to turn to your left. If you turn to the right the lines will tangle. As soon as you've turned glance up at the wing or feel with gentle brake pressure to make sure it's still stable. Corrections will now be different (normal), if the wing moves right - pull left brake to turn it left and vice versa. When you're happy that the wing is flying stable and that you have full control start to move forwards. Keep controlling the direction with the brakes and make sure you stay on the wind line. You can now start to run until you leave the ground. This is the exact way I was taught to reverse launch a paramotor and it's definitely the easiest way. Lay the wing out directly into the wind. Check that all lines are free from tangles. Always flip the risers anticlockwise. And always turn left. Build a wall every time before lifting the wing. Use small and gentle movements for wing corrections. When you start to run be fully committed to the launch. You can now launch a paramotor! After my initial training I spent around three months perfecting my ground handling and launches without the motor. Not flying is annoying, but this is the only way you become a master at ground handling a wing. Repetition enables you to be able to launch a paramotor every time without failing. If you do fail a launch whilst wearing your paramotor, unclip, lay the wing out perfectly and try again. Follow the exact method each time and don't skip any parts. I've seen people fail a forward launch and then try to just run it out, without laying the wing out correctly. This never works, they just tire themselves out, and get frustrated that they keep failing. You need to get every part right to succeed, from laying out the wing, all the way to running. Thanks for checking out How to launch a paramotor. You can find more videos that will help you launch a paramotor on my YouTube channel HERE. Find out the exact costs of training, equipment and get a full breakdown of my annual running costs > HERE. 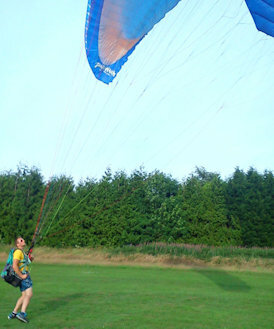 And find out whether flying a paramotor is as safe as everybody has been telling you > HERE. Darrell, I am going to follow your advise to the “T”, because I sense you are a man with integrity.